Chastity constitutes the basis of life in the monk hood. Their behaviour towards women is regulated by strict rules. A woman must be careful not to let herself or any part of her clothing touch a monk or his robes. It is forbidden for a monk to touch a female, a female animal or an object touched by a female. To Buddhists sexual life is a curse. One of the most important reasons for not being able to achieve Nirvana is bringing a child into the world. The tradition of high fertility among Buddhists appears to be supported mainly by customs rather than religious doctrine. Because of Karma, Hinduism and Buddhism has tended to restrain direct interference with fertility. It is said that Gautama Buddha did not approve of establishing nunneries. The number of Buddhist nuns has never been very great. There are nuns who wear white robes but they do not share the same rights as the monks. 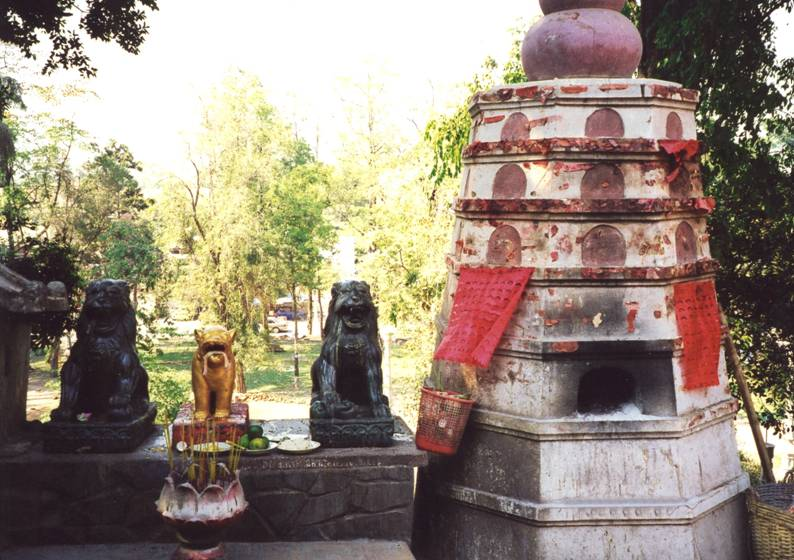 They live in side areas of the wat, separate from the men. They receive whatever food has not been consumed by the monks. Cambodia – Phnom Penh, Wat Phnom Penh, a paper money furnace. The temples of Mahayana Buddhism are more vigorous than the temples of Hinayana. One can observe incense smoke clouds, shaken sticks to tell fortunes, ringing bells, and the burning of paper money for use by deceased ancestors. LOTUS, at the microcomic level, the enlightenment of the individual and, at the macrocosmic one, the entire cosmos or universe. 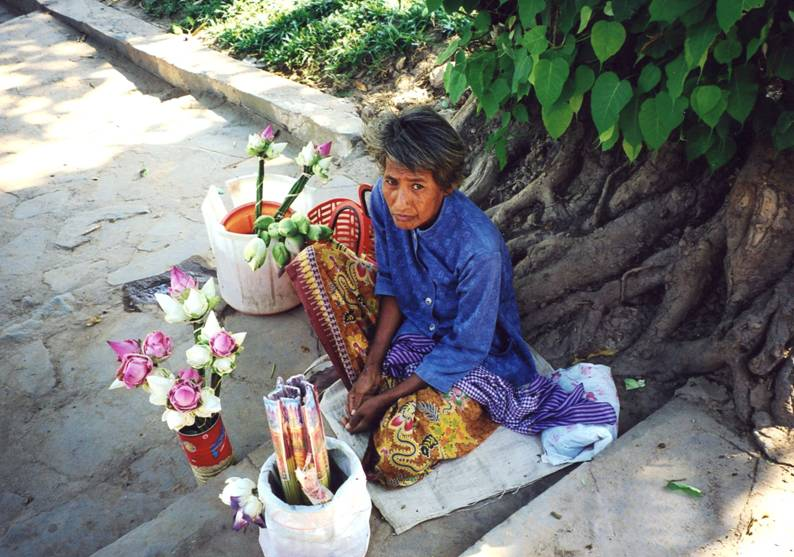 Near the temples can be seen women selling lotus flowers for offerings. The lotus is one of the most important symbols in Buddhism. With its roots in mud, this beautiful flower represents purity and perfection. The sacred blue lotus flower is the species most frequently used in Egyptian art. This flower, which from the earliest times, has been seen in decorative patterns in architecture, especially on the capitals of pillars, has at various periods, represented fertility, birth, purity, sexuality and reincarnation. In India, the white and pink Hindu lotus has been recognized as a sacred flower. Large numbers of dried lotus flowers were found in the tomb of Ramses the Second. 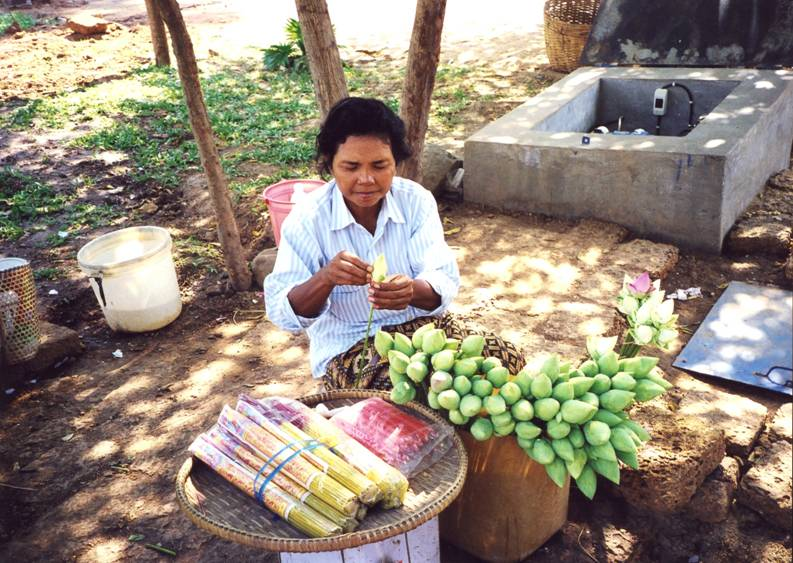 Research has revealed that lotus flowers contained a substance which speeds up the flow of blood in the vessels.